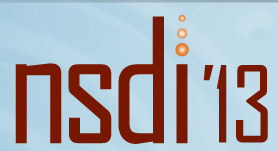 NSDI – the USENIX Symposium on Networked Systems Design and Implementation – is one of the two top conferences in computer systems. In 2013, 170 research papers were submitted. 38 were accepted. 2 were designated “Award Papers.” One of these is the paper “A Fault-Tolerant Engineered Network” by UW CSE graduate students Vincent Liu and Dan Halperin and faculty members Arvind Krishnamurthy and Tom Anderson. This marks the 4th time that a UW CSE paper has received the NSDI “Best Paper” award in the 10 years of the conference. Congratulations to Vincent, Dan, Arvind, and Tom. See the NSDI announcement here. Read the paper here.